Winter Drama -- GIANT size (for me) 5"x7"
This is a painting done from a photo that I was graciously given permission to use. (Thank you, Gerald Parras!) It's got it all--a view of our mountains on a crisp winter day, sweeping vistas of the city, and a dramatic sky. 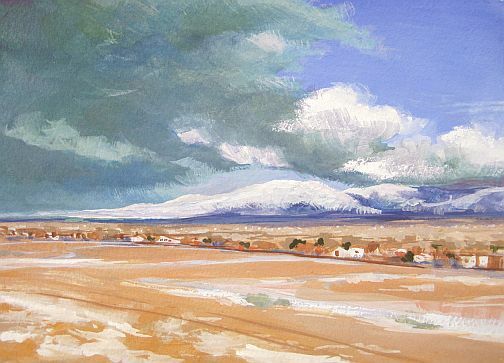 I just loved painting that wind-whipped sky and the sunny range of snow covered mountains. 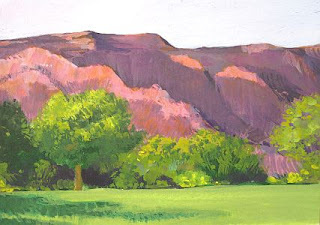 The open spaces give a nice impression of the city receding away to the peaks, and the color contrasts are pleasing. How can you miss with blue and peach? It captures that warm-in-the-sunshine, cold-in-the-shadows kind of day we so often enjoy during winter here in New Mexico. Yes, it's GIANT for me! You know I usually paint 2.5"x3.5" paintings, but this subject just called out for a bit larger (relatively speaking) format. It's on a piece of 5"x7" Fabriano Artistico 140 lb. cold press, a sample I had on hand. It's quite nice and if I have occasion I'll definitely invest in more. 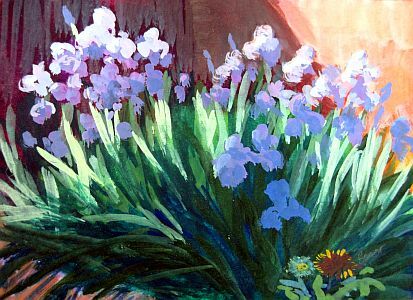 Ah, memories of gardens gone by... this one was up at our mountain house. We lived for 16 years at 7,000 feet in the Sandia Mountains. Our garden was compact but at times quite lush. This painting actually captures the place, I think. I love the contrasting bright orange and cool blues and greens, dark red and light purple, recalling the sunny place and lively colors there. It's definitely spring! The snow is gone, and it's nice and warm and sunny out, just as was forecast. (I have the sunburn to prove it.) 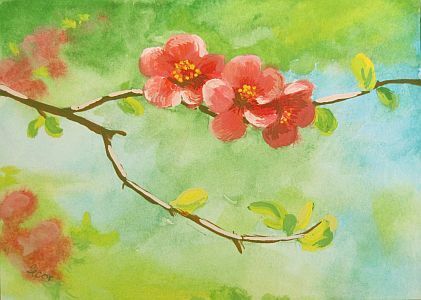 This painting captures the cheerful warmth and blue skies of springtime, I think. I like the uplifting composition and the focus on the flower trio. The limited palette of green, blue and red is simple. Sometimes simple is best. It's my usual size and the same paper I've used a lot lately, 2.5" x 3.5", on Bristol paper. I love the rich, deep jewel tones of this little painting. Our mountain in summertime really resembles a big slice of watermelon! My friend McKenzie took the photo I used for the reference, although I've played with it a lot. The contrast of the magenta, orange and red-violets with the various greens gives it some pop, that's for sure.